General Motors’ Australian unit Holden is set to end local production in October, and along with the end of production will be the demise of the rear-wheel-drive Commodore, the current version of which is sold here in high-performance trim as the Chevrolet SS. A new Commodore is coming, though it’s based on GM’s front-wheel-drive E2XX platform and twinned with the Opel Insignia Grand Sport. Thus, to mark the end of the rear-wheel-drive, Aussie-built Commodore, semi-official Holden tuner HSV has unveiled something very special. Behold the GTSR W1 super sedan. As was rumored, the car is powered by the LS9 supercharged 6.2-liter V-8 fitted to the C6 Chevrolet Corvette ZR1 supercar. Peak output of the engine in this latest application is 635 horsepower and 601 pound-feet of torque. The mighty motor is paired exclusively with a close-ratio 6-speed manual transmission, and according to HSV this combination will be good for 0-62 mph acceleration in 4.2 seconds and a quarter mile time of 12.1 seconds. The top speed is governed to 155 mph but unlimited should reach 182 mph, the figure still limited by the car’s short gearing. In the handling department, the GTSR W1 benefits from a race car-spec suspension system with SupaShock adjustable dampers instead of the Magnetic Ride Control setup used by other HSV models. The main benefit is said to be the lowest frictional losses of any commercial damper system. Other upgrades include massive AP Racing brakes, staggered wheels measuring 20×9 inches up front and 20×10 at the rear, and Pirelli P Zero Trofeo R tires. Also differentiating the car is a wider stance than the previous HSV range. Pumped fenders add about half an inch to either side. These lead at the front to the aggressive bumper with large intakes and integrated splitter. Inside, the car features diamond-quilted Alcantara trim for the seats, more Alcantara on the steering wheel, and “W1” embroidery for the headrests. The gear lever also gets an Alcantara grip and leather boot. Just 300 GTSR W1 sedans will be built for the Australian and New Zealand market, with pricing starting at approximately $130K. 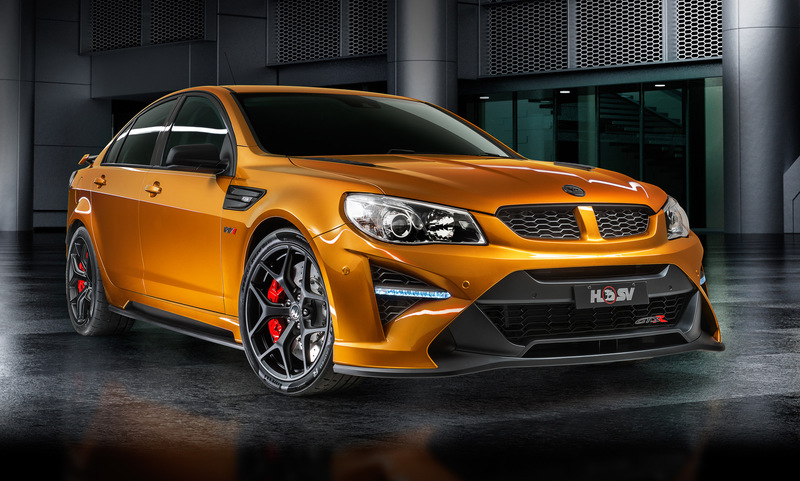 When production starts in April, HSV will also launch a special model using the GTSR name. This won’t be a limited edition model, and it will stick with the LSA supercharged 6.2-liter V-8 already used by HSV. Its output will be pegged at 583 hp. And in case you were wondering, “GTSR” is a name used by HSV for a special model launched in 1996, while the “W” in the GTSR W1 name is meant to represent HSV’s parent, Walkinshaw Performance.